The various country homes are spread over the park. You have the choice of many variants: There are four person cottages (3*** NL-9431-17), detached near the water, with bedroom and bathroom on the ground floor, or a 4**** variant (NL-9431-18), luxurious and detached near the water with a sauna and usually with a bedroom and bathroom on the ground floor and usually a solarium). There are 6 person cottages (3*** NL-9431-19), detached and semi-detached, near the water, with bedroom and bathroom on the ground floor, or a 4**** variant (NL-9431-20), luxurious and detached near the water with a bedroom and bathroom on the ground floor.). There are 8 person cottages (3*** NL-9431-21), detached near the water, with bedroom and bathroom on the ground floor, or a 4**** variant (NL-9431-22), luxurious and detached near the water with a sauna and skylight and some with a washer and/or dryer). There is also a 5***** luxurious 6-pers. (NL-9431-28) and 8-pers. variant (NL-9431-23) with sauna and jacuzzi with bedroom and bathroom on the ground floor, solarium, ornamental fireplace and wireless internet. 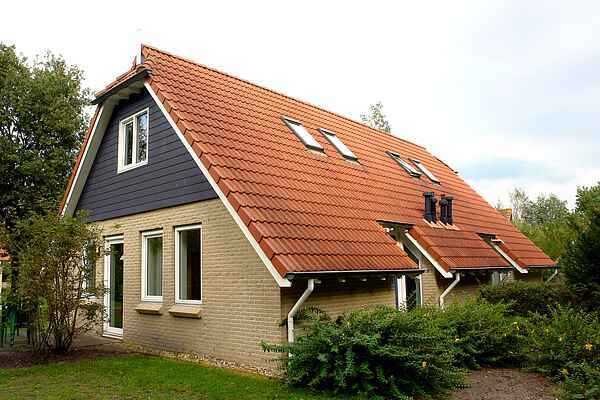 The 12 person country house (NL-9431-24) consists of 2 adjoined 3*** 6-pers. variants. So you have use of two completely furnished kitchens. They are within walking distance from the central building and are not directly on the water. Finally, there is a studio for 2 persons. (NL-9431-25). These are simple, adjoined bungalows, located in a semi-circle. They are simply furnished and are perfect for a low budget/explore Drenthe holiday. All houses have a garden with terrace and garden furniture.